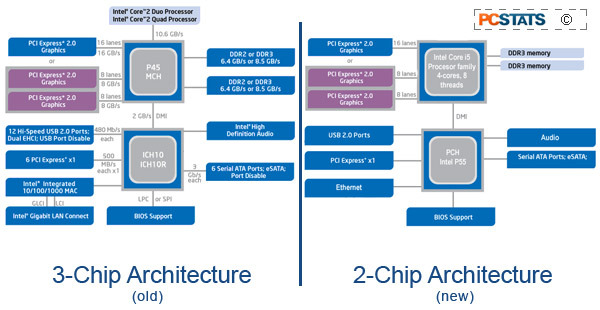 In the past couple years Northbridge chipsets for the Intel platform have included the 945P, 965P, 975X, P35, P45 and so on. Common to each generation was a discrete silicon chip, and of course, each time some aspect of the technology advanced an new generation of chipset and motherboard emerged. This is partly because it's good business to make existing technologies obsolete, and because a Northbridge chipset acts as bridge between the CPU, system memory, graphics card and the rest of the PC. The third member of the family (the first being the CPU) is called the Southbridge. It's job is to bridge the CPU-Northbridge with the rest of the computer; input/output devices like the hard drive, PCI/PCI Express expansion slots, sound card, network controller and even mouse/keyboard. 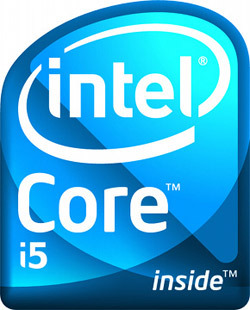 On the Intel platform these have included the ICH7, ICH8, ICH9 and ICH10 Southbridge chipsets. So once again, everything you know about computers is about to be stood on its head. The P55 Express chipset integrates both the memory controller and 16 PCI Express 2.0 on to the die of the "Lynnfield" CPU. The P55 Express Platform Controller Hub will also have up to eight of its own PCI Express lanes. The changes to the PCI Express graphics sub-system won't have a huge impact on end-users, most P55 motherboards will still have two or three PCI Express slots that can be run in (x16/x4) or (x8/x8/x4) mode, the only difference is that now the first two slots will be handled directly by the CPU, which will have the nice side effect of removing some system latency. Although the P55 Express chipset is no longer handling memory itself, it's still important to note that memory compatibility on socket-1156 "Lynnfield"-compatible motherboards will be DDR3-exclusive, and run in dual-channel mode. Expect supported memory speeds to run from DDR3-800 up to DDR3-1333, with overclocking support going all the way up to DDR3-2000+. Since the P55 Express Northbridge doesn't have many jobs left to do, it actually doesn't need a very fast link to the processor. Instead of equipping the P55 chipset with a complex and expensive-to-produce QPI link, Intel has instead used a slower 2.0GB/s DMI link for the Intel P55 Platform Controller Hub to communicate with the processor. Both northbridge and southbridge have been merged into what Intel is now calling the P55 Platform Controller Hub. The storage and media interface capabilities are pretty similar to that of Intel's well-known ICH10R southbridge, with support for 14 USB 2.0 ports, six SATA 3Gb/s ports with support for RAID 0/1/5 and 10 modes, and gigabit Ethernet. Gigabyte has unveiled a suite of software and hardware technologies which are making their debut with its P55 motherboards. For quite some time, Gigabyte has placed two Basic Input Output System (BIOS) chips on its motherboards. The secondary BIOS chip works as a physical backup should the primary BIOS chip fail. With Smart DualBIOS, Gigabyte has doubled the memory size from 8MB up to 16MB, and the extra memory means that these BIOS chips can now do some new tricks. Smart DualBios can save critical data such as passwords into memory, or even work as a scheduler for important dates and events. Smart QuickBoost is a built-in system tuning feature can adjust CPU speed on the fly, for dynamic processor overclocking inside of windows. Smart QuickBoost has three levels of overclocking that will adjust processor speeds up to 400MHz (3x133MHz) above the CPU's stock speed. This feature works well when paired with Smart QuickBoot, which has two modes. The first bypasses BIOS hardware checks that can take a few seconds during start-up, while the second enables a hybrid S3 (suspend) and S4 (hibernate) state, which allows the system to store its last used state, which allows the system to power on and resume exactly where it left off last time. Gigabyte's Smart Recovery utility allows for system backup by creating snapshots of the hard drive periodically, so it's possible to restore deleted or altered files and settings from several different dates in the past. Smart Recorder is a system logging tool will monitor when your computer has been turned on or off, as well as keeping a log of when large amounts of data are transferred between hard drives. Finally, Scheduling using Gigabyte's Smart Timelock feature can lock down the system during set hours on certain days of the week, for both system security purposes and parental control.